Went birding at a little park across from the beach the other day, but there were no birds to be seen. All I found was this Golden Silk Orb Weaver, hanging in front of me, its immense web stretched across the walking path. I’d never seen such gigantic spiders till I moved to Florida – I’ve since learned that these are actually quite common. Including the legs, this one was at least 4-5 inches across! 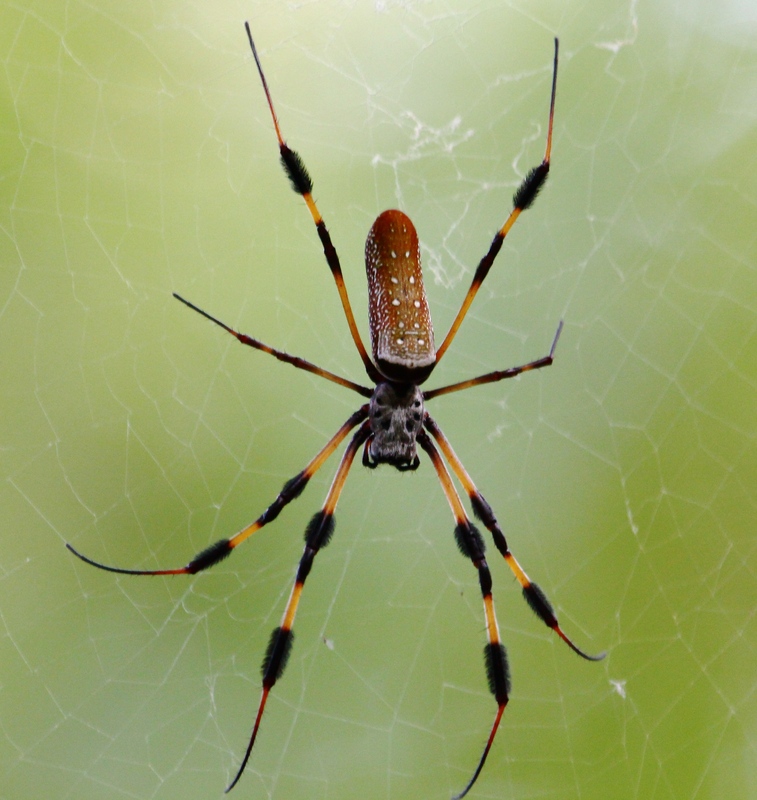 This entry was posted in Nature and tagged Golden Silk Orb Weaver. Bookmark the permalink. I really like spiders and have run across a number of different orb-weavers, but never one like this one. I am always amazed by the intricate webs that these spiders make–some of nature’s artists. Yes, i agree with you, Mike. Spiders (and their webs) are often given a ‘bad rap’, when in fact they are truly amazing engineers of delicate and complex works of art! I’ve become a far keener observer of nature in general – and really appreciate the sights that others capture – since I started photographing birds! I think you’re absolutely right, Donna – in fact, I did see MANY Brown Pelicans passing overhead, and I’m sure the small birds were in the trees somewhere.